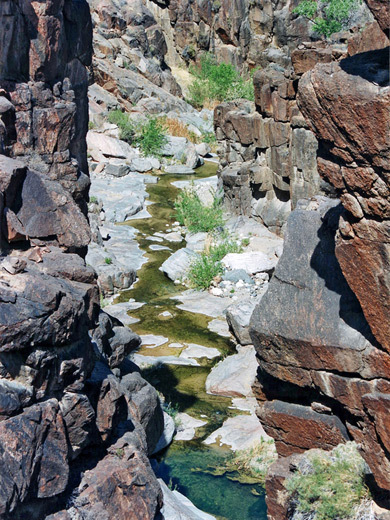 It may not be a true slot canyon, but some parts of Milkweed do have long, narrow passages with a permanent stream running through, numerous pools, cascades and small waterfalls, enclosed by pretty rocks of pink and grey limestone, sometimes containing thick veins of white quartz. The surroundings change from quite densely-wooded land at the start to cactus desert at the lower end, where the limestone gorge empties into the larger Spencer Canyon which in turn meets the Colorado River after another 8 miles. 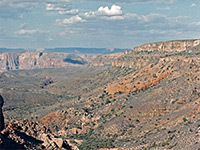 This is a particularly remote and untouched region, in the middle of the Hualapai Indian Reservation - a part of the Grand Canyon system but a world away from the hustle and bustle of the main south rim viewpoints. 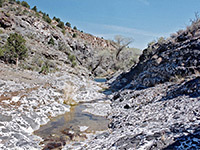 Milkweed Canyon is quite a long drainage, running for over 15 miles across the mostly flat, bushy plains of the Hualapai Indian Reservation, towards the western edge of the Grand Canyon. Only the upper end is accessible by car; to get there, drive 16 miles along Reservation Route 1 (Buck and Doe Road) which forks off old US 66 a few miles west of the tribal headquarters town of Peach Springs; the road is paved for a few miles, then good quality gravel. 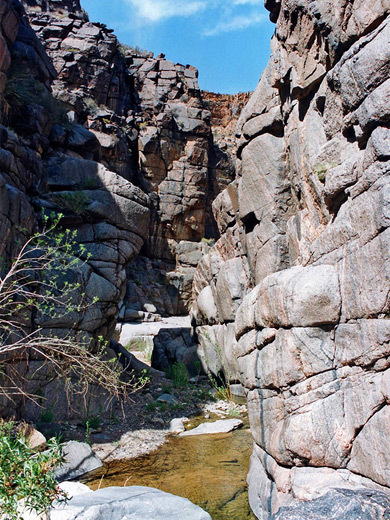 The start of the canyon is reached by a short side track to the right (north) 3 miles after the main road crosses under some powerlines for the second time, and just before a narrow bridge. The side track crosses the dry streambed of upper Milkweed Canyon three times, ending at a cleared area (elevation 4,740 feet) with a rusty old car and a few abandoned wooden buildings - a good place to camp, though rather spooky at dusk. The Hualapai require all visitors to purchase a hiking and/or camping permit before entering the backcountry of their reservation, and they seem to enforce this rather more keenly than the Navajo. 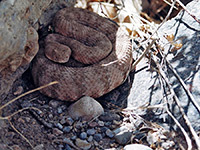 The regulations are posted on all entrance roads, and permits may be obtained from the wildlife preservation office in Peach Springs on US 66, just west of the new Hualapai Lodge hotel. However, there is a suggestion that most lands have recently been closed to hikers, in which case Milkweed Canyon is now inaccessible. 12 views of Milkweed Canyon. TopoQuest topographic map of Milkweed Canyon. A small earthen dam blocks the streambed near to the old buildings though the creek is usually dry at that point. It begins to flow soon beyond (at Milkweed Spring) then a short distance downstream crosses some exposed terraces with unusual mottled patterns (rocks of the Buck and Doe conglomerate) and has some quite deep pools, after which the valley alternates between open areas and more overgrown parts. Walking is easiest in the flat streambed or just at the side, though some bushy parts may be better passed by climbing up the low valley walls a way and traversing on ledges above. 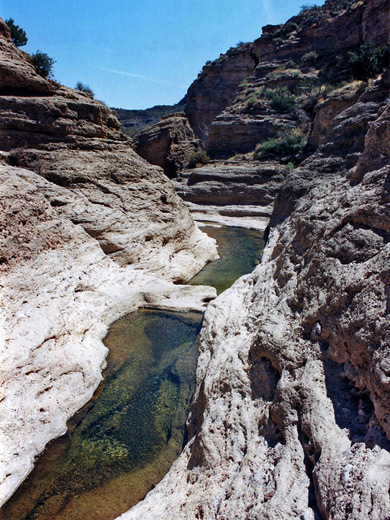 This early part of Milkweed Canyon is mostly level, neither very deep nor very wide, and the shallow waters trickle by quite gently. The creek curves around several wide bends, passes under some powerlines, later has two sharper bends then narrows before a sequence of rocky channels with vertical walls and more clear pools, a nice section which ends quite soon at a waterfall preceding a big descent, near the confluence with some other tributaries where the canyon becomes 600 feet deeper and much wider. Ahead lie distant angular cliffs and ravines, the first sight of the familiar Grand Canyon scenery. The best way to continue, if the current is not too great, is to climb down the waterfall at the edge of the drop off and continue down the overgrown talus slope below, where the stream flows past many large boulders that create deep pools in between. After 30 minutes of strenuous clambering, the slope lessens, the boulders become smaller but the area still has a lot of trees and bushes. Wedged between two of the rocks are the remains of a truck, presumably washed down from the main road, a sign of the severe floods that must occasionally rush down the canyon. One mile further the creek runs through a wide valley, now well away from the shade of the cliffs. The hotter environment reduces undergrowth and once more the water course is generally level and free of obstructions so walking becomes much easier; another drainage (West Water Canyon) joins from the left and ahead the land is quite open as the stream flows over flat limestone terraces, forming small cascades and pools inhabited by fish and frogs. The bushes have been replaced by various species of cacti, most noticeably many old specimens of ferocacti, especially along ledges on the southeast-facing walls. Fast moving lizards dart around and the whole scene is quite desert-like and also very peaceful. Vertical walls reappear as the stream starts to cut deeper through the sandstone strata and then into the rocks beneath - grey limestone mixed with veins of pinkish red minerals that sometimes predominate. After a while the canyon is narrow and sheer-walled, and remains so for about 3 miles. The stream is more confined and so forms deeper pools with more waterfalls, and the combination of blue water, pinkish rocks, occasional green cacti is quite striking. The limestone gorge has one major obstacle quite near the end, when a channel through a particularly enclosed, sheer section ends at a chokestone a few feet above a long, deep pool - to pass requires either jumping down and swimming, or a quite lengthy climb up the steep cliffs then back down the far side. Not far past this point the limestone walls recede, the canyon opens out once more and the water stops flowing, and seeps away underground. An alternative to hiking through the gorge at water level is to walk along near the rim, across the wide plateau above - this is almost flat with little plant growth which makes for much quicker progress. Beyond the end of the narrows there are another three miles of easy terrain before the junction with Spencer Canyon. A round trip of about 15 miles to the chokestone and back takes from 8 hours.